You know that friend, the one who adds a spark to everything you do, whether it’s a Saturday night out or a Tuesday afternoon? That’s UV. We’re that friend. And we’re proud of it. We bring our bright and colorful energy to every one of our award-winning, naturally-flavored vodkas. And because every experience, every moment, every day is better when there’s a “together”, each one of our unique flavors is made for maximum mixability. Wherever you are and whatever you’re up to, there’s a UV+1 Cocktail to match your moment. So, get ready because we think—no, we KNOW—the next great experience is right around the corner. And it’s full of possibilities. 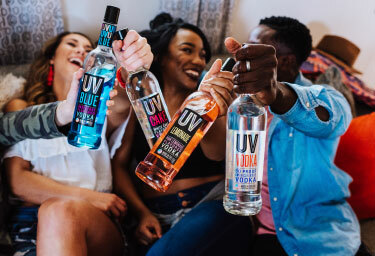 Call the squad, grab UV and just add you. We hate to brag but we thought you might like to know that UV Vodka has won a bunch of awards for its top-notch quality and taste. Here are some of them. Impact Magazine, the leading publication in the industry, has recognized UV Vodka for being one of the most exciting and respected brands in the business. UV Whipped was awarded Platinum in a blind taste test at the SIP Awards. UV Whipped won a Double Gold Medal at the 2012 WSWA Wine and Spirits Tasting Competition. UV Vodka was rated a 93 at the Ultimate Spirits Challenge. A rating of 90–94 is considered excellent and highly recommended. UV Sweet Green Tea won Platinum at the SIP Awards. This prestigious award is determined in a blind taste test by a panel of consumers. This award is especially prestigious because the Double Gold Medal is reserved for those spirits that receive a unanimous vote for a Gold Medal by all judges. UV Vodka has been rated as “Superb, Highly Recommended” in Wine Enthusiast Magazine’s buying guide.